What is wrong with this picture. 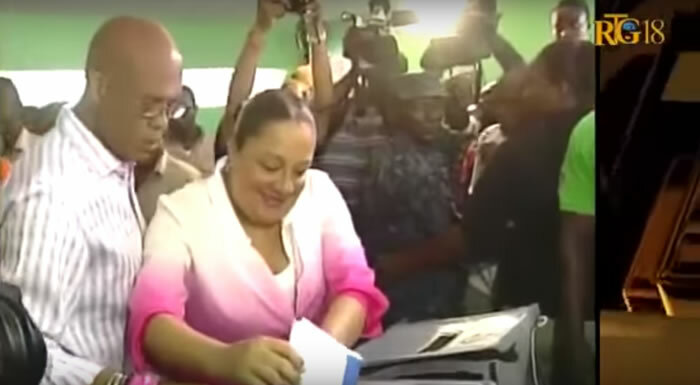 First lady Sophia Martelly performing her civic duty by voting on August 9, 2015 in the election for Senators and Deputee with her husband, President Michel Martelly. This election could have been even more important for first Lady Sophia Martelly. She was actually a candidate for the senatorial seat in the west but was disqualified for citizenship issue. Authorities at the CEP found that the first lady was not a Haitian citizen and as a consequence couldn't run as a candidate in this election. Charles Saint-Remy alias Kiko, the brother of First Lady Sophia Martelly and Woodly Etheard alias Sonson La Familia aka SOS, were once business partners. Woodly Etheard is a notorious leader of Gang Galil, involved in many kidnapping and extortion cases. Kiko and Sonson used to run a restaurant business "La Souvenance" located at Morne Brun, in Petionville which used to supply food at the National Palace and other important government departments of the country. Kiko is one of President Martelly's closest clan, fights for Martelly's control of territory. During the later part of the previous year when political pressure against Martelly was mounting, to divert the public attention, Kiko accused former Prime Minister Laurent Lamothe in a massive march of anti-government protest on November 18, 2014. He blamed him on charges of corruption, and held him responsible for a series of arrests, including 20 demonstrators in the earlier month and called for his resignation. Kiko further accused Lamothe on charges of exploiting justice, neutralizing competitors, operators and activists. On this day of protest, the police opened fire on the anti-government protesters- two persons were killed and four were injured. On Thursday, April 30th around 11pm, the Departmental Electoral Office of Litigation (BCED) West 1, has given its verdict that the first lady Sophia Martelly meets all the requirements of the Haitian constitution and the Election Decree to become a candidate for the Senate. Earlier, after submitting her nomination, some challengers like Dr Louis Gérald Gilles of Fanmi Lavalas, Marie-Denise Claude, Me Tranquilor Mathieu (Unité Patriotique) and the platform JUSTIS had challenged her candidacy on two main grounds. Firstly, she holds dual nationality, U.S and Haitian and secondly, as the President of the National Commission Against Hunger & Malnutrition, she still holds a fund of $234 at her disposal on which she has not received any certificate of discharge as required for accounting of public funds, under the law. Sophia Martelly is the First Lady of the Republic of Haiti since May 11, 2011. It is often said that, behind every successful man there is always a more successful and strong woman. The First Lady is often referred by her friends as "the power behind the throne" while the enemies call her "iron lady". Although, the Haitian press mostly refrained from making too much commentary on the presumed candidacy of the First Lady, it is a fact that nobody likes power vacuum. Sources close to the First Lady indicate that she has decided to succeed her husband. She has formed her presidential exploratory committee, two years before, and she has been consistently doing a very good job on behalf of the Haitian people and recently has expressed her wish to work for the center-right liberal Party, Haitian Tèt Kale (PHTK). First lady Sophia Martelly thinks she can take the heat in running for an elected seat in Haiti. She will be a candidate to become Senator of the west Department which is considered to be one of the most crowded seats in the up coming election. She filed the required documents with the CEP to become a candidate in the Aug. 9 election. This decision also put an end to the rumors that she would be running for president to replace her husband. First Lady of Haiti, Sophia Martelly, attended two ceremonies related to maternity and obstetrics' care in Southeast Department of Thiotte and the commune of Anse-a-Pitre. On hand for both functions were Dr. Ted Lazarre, Director of Health; Florence D. Guillaume, Public Health and Population Minister; Thiotte Deputy Jean Camille Desmarattes; Thiotte and Anse-a-Pitre mayors; French Ambassador to Haiti, Patrick Nicoloso, and other officials. In Thiotte the ceremony was for the launching of the Maternity SONUB, and in Anse-a-Pitre Center for Obstetric Care of Banane was re-opened. Dr. Ted Lazarre stressed the effect the programs at Maternity SONUB and Obstetric Care Banane would have on reducing death and disease in these two provinces. He added the two communities would have equal access to maternity and birth services, delivered at a high level of care. First Lady Sophia Martelly, whose service project is public health, was present for the 2013�'2014 graduation ceremony of the 3rd Promotion Class of Epidemiologists. 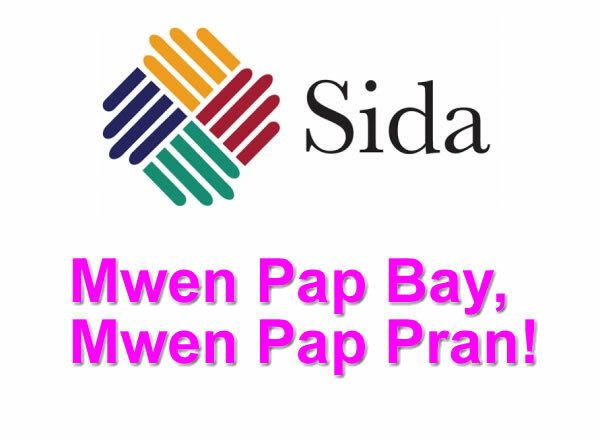 Other health officials in attendance were Health and Population Ministry General Director, Dr. Georges Dubuche; Centers for Disease Control and Prevention Representative, Dr. Victor Caceres; and Communications Minister, Dr. Rudy Heriveaux. Credit was given to the Department of Epidemiology by Dr. Martial Beneche, President of the 3rd Promotion, for its superb work in preparing the 3rd Promotion for the work ahead of them. Mrs. Martelly reminded the graduates of the challenges they will face in dealing with the epidemics that plague the population. Most recently an outbreak of Chikungunya has spread rapidly throughout the Caribbean, the first cases reported in Haiti in May 2014. Mrs. Martelly acknowledged that "the recognition of epidemiology as a field of study is relatively new, and yet it is one of the pillars of public health and modern medicine." First Lady Sophia Martelly's advocacy for the poor began at the age of 18. It was on Christmas Day she volunteered to deliver dinners to the hungry. 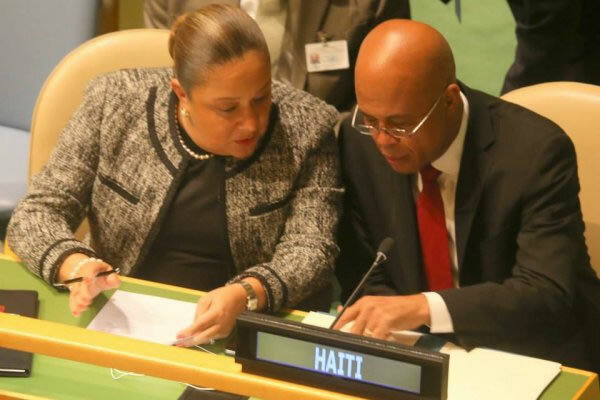 It was this shared compassion for Haiti's poor that brought her and husband, President Martelly, together. Since gaining the spotlight, the Martelly's have built a reputation for becoming involved in programs and causes pertaining to the neediest on the island. The First Lady has her own office out of which she operates at the National Palace. She is a natural in her role as social advocate, overseeing projects and heading committees for many charitable causes.